It’s been a long while, hasn’t it? I’ve had a few questions as to where I went, and it’s a subject that’s still a little hard to talk about but I’ll explain that (and the future of the Vintage Lifestyle Hour) when I’m feeling more up to it. It’s not a happy tale, by any means, but let’s be cheerful for now, shall we? Thanks to an Amazon gift card from a lovely friend (my birthday was last month), I was able to have a few movie nights with my sister to see some things we missed in the theater ( Star Trek: Into Darkness, Iron Man 3 and, most importantly and impressively, This Is The End — None of these are vintage, though, and shall therefore be reviewed on another blog). But it also let me grab a few books that I’ve been coveting for years. And one I didn’t even know I wanted! Look what just came in the post! I feel like I’ve been waiting for this to arrive for a year, but its only been a few days. 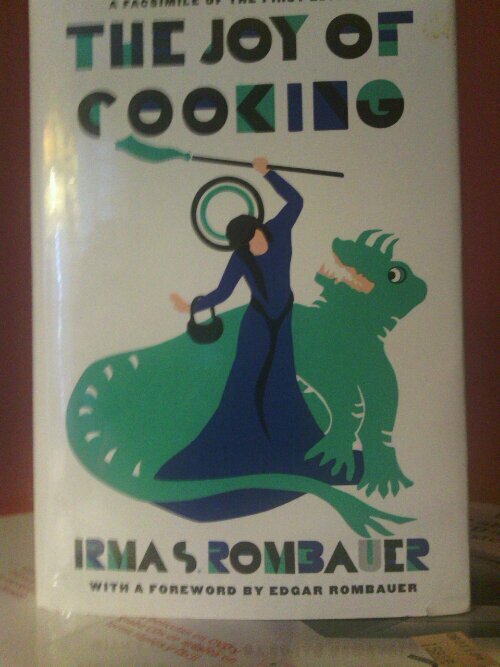 It’s the 1998 facsimile of the original, 1931 edition Irma S. Rombauer’s classic cookbook, “The Joy of Cooking“. Bloody hell, is it thick! And there are such neat sections that run spectrum from every sort of souffle you could imagine to simple things like what to do with leftover ham. Of course, I never have food in the house so why I collect cookbooks, I couldn’t say. But I’m bound and determined to make something out of this book before Solstice — Even if it kills me. Even if I end up in hell with my back broken!